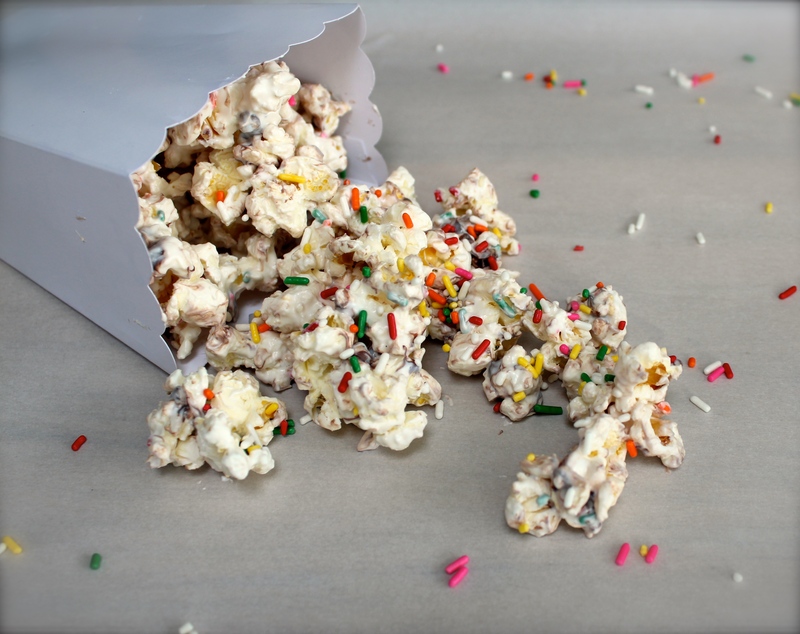 Happiness Project: #54: Birthday Candy Popcorn! Birthdays! HUZZAH for Birthdays! Up until I became a Mother of my beautiful 2 year old Daughter, I was always very C’est la vie about celebrating another birthday. But thanks to the love that I have with my Baby Girl, my heart has changed, in every way that matters most. Especially, when it comes to birthdays. Because, yes, mommyhood truly DOES change all. So for my one & only Daughter’s 2nd birthday earlier this month, besides creating a Vanilla Strawberry Cake with a side of Funfetti Minnie Mouse Cupcakes, I also threw together some Candy Popcorn for all of the kiddos at her Minnie Mouse themed party. With Sprinkles. And Chocolate Chips. And maybe a little bit of white chocolate candy melts. Because movie time is always made better with popcorn AND candy, right? Right! And the best thing about this super FUN popcorn recipe? It’s quite possibly the SIMPLEST recipe that a busy parent can hope for. Which is beyond (beyond) wonderful! Believe me. I know. Oh, and did I almost forget to mention, it’s very versatile, as well? It is! Ready for some Pop-tastic (ha!) Party Food?? Look no further! Pop the 2 bags of popcorn according to the bagged instructions. Place the popped popcorn into a large bowl and set aside. Heat up the candy melts in a microwave safe bowl, in two to three 20 seconds intervals, strirring in between each 20 second interval, until smooth and fully melted. Slowly pour the melted chocolate into the bowl of popcorn. Then layer with both cups of the chocolate chips and sprinkles. While the melted chocolate is still warm, with a rubber spatula, gently stir the chocolate and candies into the popcorn, making sure to toss the popcorn at the bottom of the bowl until fully coated. AND serve! In all of it’s gooey, messy, joyful yumminess! « Happiness Project: #53: My Baby Girl’s Favorite Strawberry Frosting!